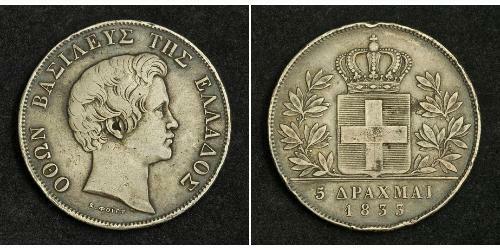 1833, Kingdom of Greece, Othon I. 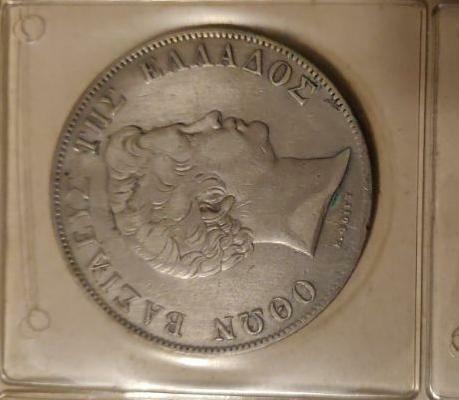 Large Silver 5 Drachmai Crown. Condition. Scratches (graffiti) in reverse and few rim hits, otherwise a nice VF-XF! 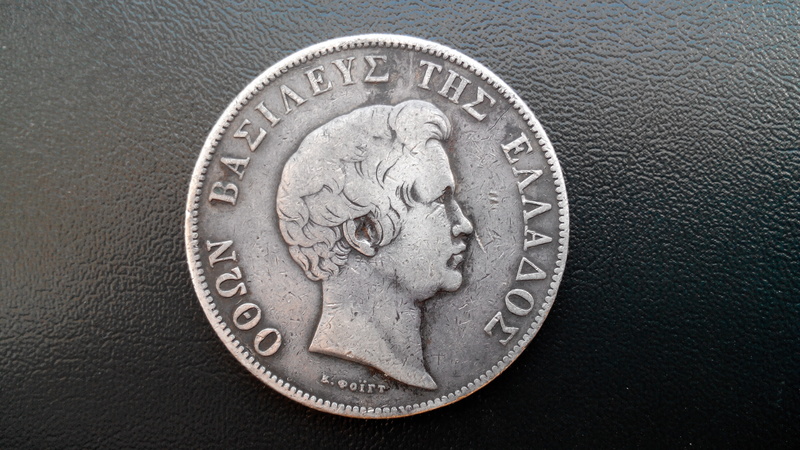 Obverse: Head of Othon (Otto of Bavaria) as King of the Hellenes right. Greek legend around. 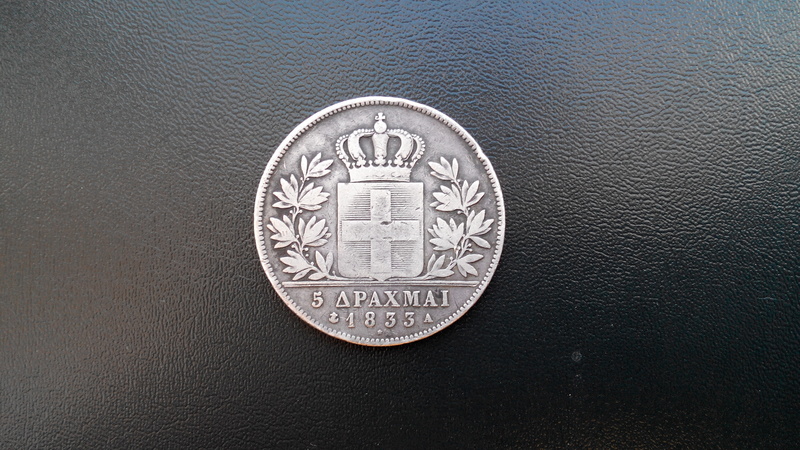 Reverse: Crowned Greek shield, flanked by olive-branches. Denomination and date below. 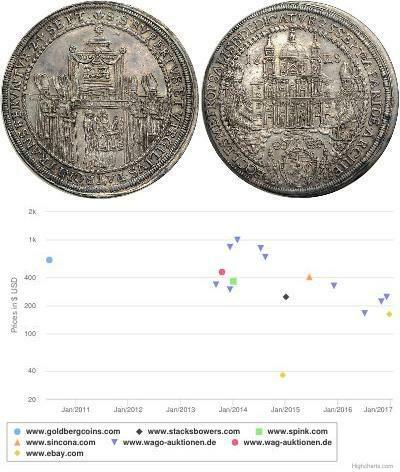 Otto was the second son of King Ludwig I of Bavaria. While the elder son, Maximilian, ascended to the Bavarian throne, Otto became the first king of modern Greece. 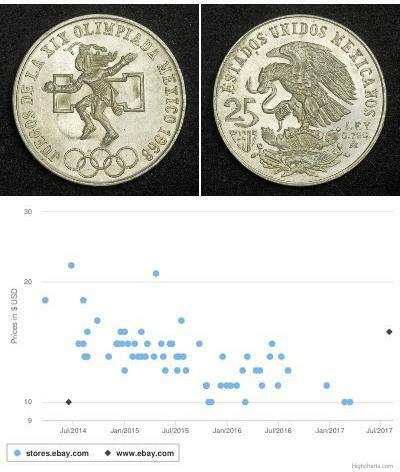 His intentions were honorable, but he had compromised himself politically and had to obey the great powers of Europe who had placed him on the throne. When he didn’t attack the Ottoman Empire, his nation’s arch-enemy, he lost the support of the Greek people and was deposed. 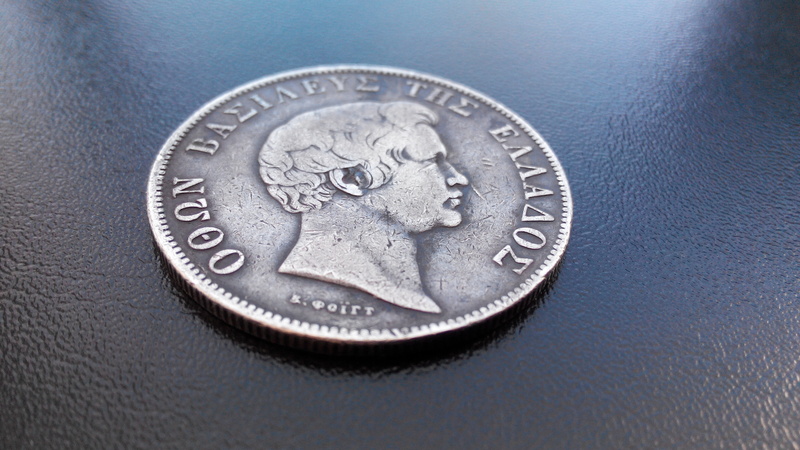 As a symbol of modern democratic force in Greece, this coin has few equals. Otto, prince of Bavaria or Othon, king of Greece (&Oacute;thon, Vasil&eacute;fs tis Ell&aacute;dos; 1 June 1815 – 26 July 1867) was made the first modern King of Greece in 1832 under the Convention of London, whereby Greece became a new independent kingdom under the protection of the Great Powers (the United Kingdom, France and the Russian Empire). The second son of the philhellene King Ludwig I of Bavaria, Otto ascended the newly-created throne of Greece while still a minor. His government was initially run by a three-man regency council made up of Bavarian court officials. Upon reaching his majority, Otto removed the regents when they proved unpopular with the people and he ruled as an absolute monarch. Eventually his subjects' demands for a Constitution proved overwhelming and in the face of an armed but peaceful insurrection, Otto granted a Constitution in 1843. Throughout his reign, Otto faced political challenges concerning Greece’s financial weakness and the role of the government in the affairs of the Church. The politics of Greece of this era was based on affiliations with the three Great Powers, and Otto’s ability to maintain the support of the powers was key to his remaining in power. To remain strong, Otto had to play the interests of each of the Great Powers' Greek adherents against the others, while not aggravating the Great Powers. When Greece was blockaded by the (British) Royal Navy in 1850 and again in 1853, to stop Greece from attacking the Ottoman Empire during the Crimean War, Otto’s standing amongst Greeks suffered. As a result, there was an assassination attempt on the Queen and finally, in 1862, Otto was deposed while in the countryside. He died in exile in Bavaria in 1867.